I have been debating on when to get Harper's hair cut for the first time but it has grown so much lately and is just kind of out of control. I call it the "Carol Brady" hairdo. Or kind of a shaggy mullet. I've heard once you get their hair cut - it will grow back thicker and better so I decided it was time to take the plunge! My friend Julee cut it for her. I'm glad I had someone I know do it for the first time because that's special to me - she even saved the hair in a tiny envelope for me! Harper did pretty good. I was so worried but I handed her some animal crackers and that kept her still. 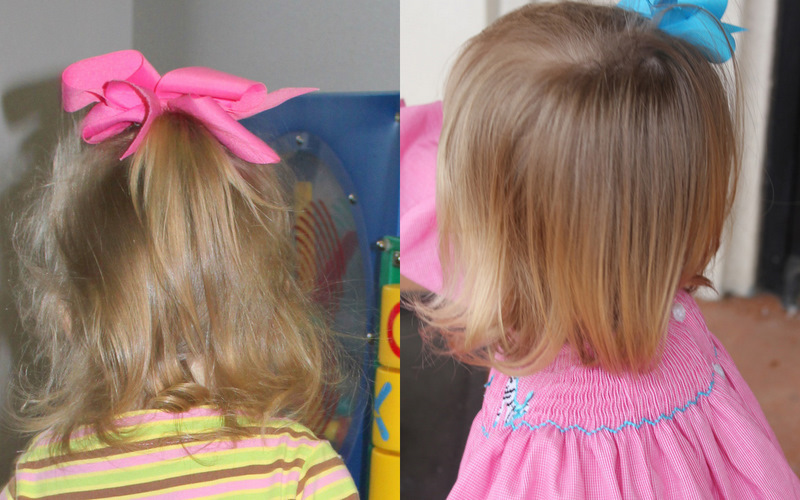 Julee did a great job - it's not a dramatic change but she evened it up in the back and I think she looks so cute! After her haircut Harper and I had a little "Girl's morning". Scott had some "guy stuff" going on this morning so it was fun to just have a little girl's day. I use "fun" loosely when it involves shopping and eating with a two year old but I have to admit I was thinking about how much fun it will be one day when my girls are older and Daddy goes hunting or does something with guys and we can just have a Girl's day or even a girl's weekend. I don't want to look ahead too much and miss these sweet days but I do know I have soooo much to look forward to! And yes - I could just die I think this outfit is so adorable. Especially with her matching Zebra shoes. This picture is kind of blurry because she was in action - but that's how a lot of our pictures turn out. We ate lunch at Jason's Deli and I took her to the bathroom and she was holding my hand and waving at every table as we walked by. I'm glad I'm not raising a wallflower. The child is not shy. This is a little picture of the back of her head. The first one is from a month ago so it was even longer today but you can tell in the second picture it's been evened out into more of a bob. As her sides grow - we can get it into more of a bob. I can't believe how fast my little baby is growing. She's so much more of a "girl" every day! I guess I can now check "Getting Harper groomed" off my to do list before Hollis comes. ha ha !